Group Capt. 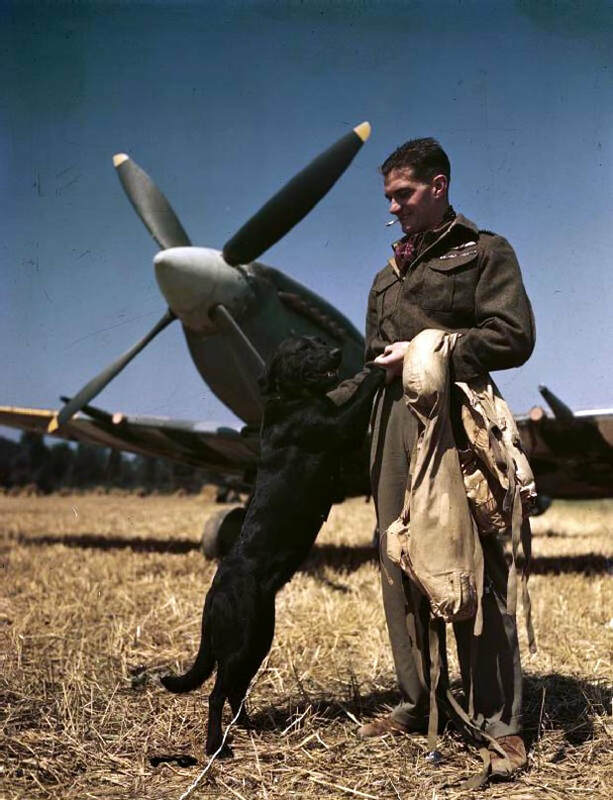 "Johnnie" Johnson, Commanding Officer of the Canadian-manned Kenley Wing, brings his Spitfire Mk IX in for a landing following a fighter sweep over Nazi occupied Europe in May of 1943. 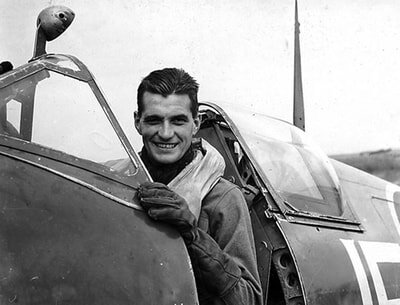 Johnson was the top scoring British ace of WWII. Born in 1915 Johnson was educated at Loughborough School and Nottingham University, where he recieved a degree in civil engineering. He was called up from the Volunteer Reserve in August 1940 and in early September joined 616 Squadron but was soon hospitalised to have a fracture reset. He returned to the squadron in December of that year. During the Summer of 1941 Johnson flew as a member of Douglas Bader's section in the Tangmere Wing and by early 1942 he had been awarded the DFC and was an ace with five victories. He was given command of 610 Squadron and during the Dieppe raid on19 August 1942 he scored his seventh victory and shared in the destruction of two other Nazi fighters. He would have to wait until the following year for his next confirmed victory. In March 1943 Johnson was given command of the Canadian fighter wing at Kenley. 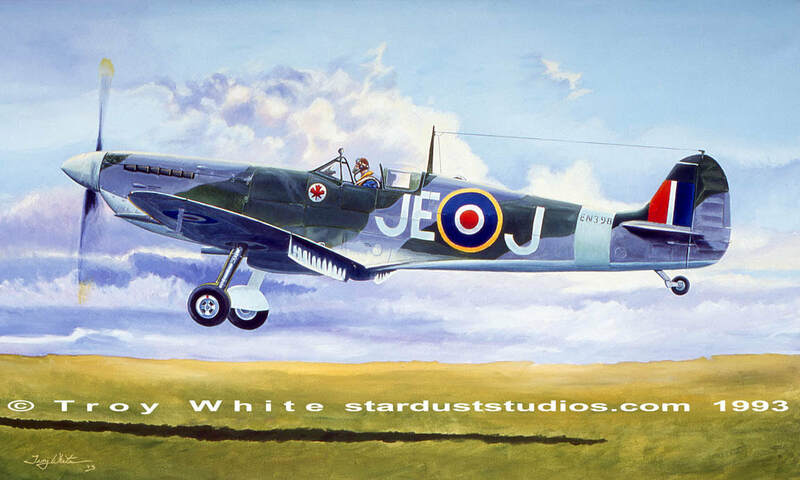 He was given a new Spitfire Mk IX (EN398) and his initials JEJ were painted on the fuselage. He scored most of his victories in this aircraft which is the subject of my acrylic painting which I completed in 1993 "Wingleader". He scored twelve confirmed solo victories and five confirmed shared victories in (EN398). His total confirmed solo victories at that time was nineteen. EN398 never aborted a mission due to technical problems. By the end of the summer season when the wing was stood down for R&R, Johnson's score stood at Twenty-one. In the lead up to the D-Day landings Johnson brought his score up to 24. Johnson's wing was the first to be begin flying from French soil following the invasion. The Germans were never far away so encounters with the enemy were more frequent and the wing had the luxury of being able to loiter in combat arenas for longer. 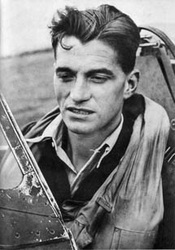 On the 23rd of August Johnny scored victories thirty two and thirty three to surpass South African Sailor Malan's tally. 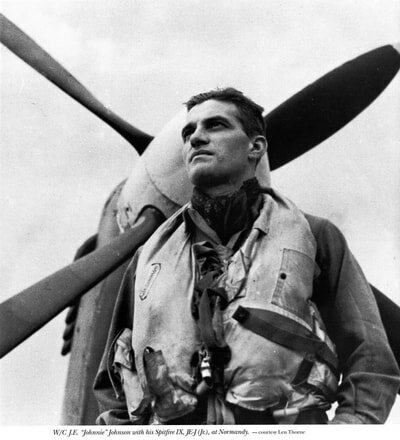 Johnson remained in combat until the end of hostilities in Europe. 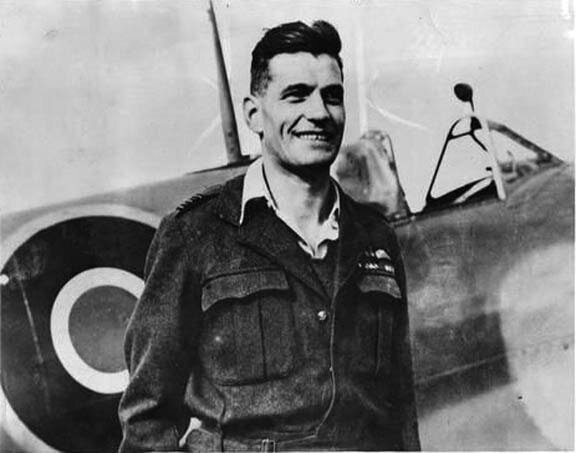 By VE-Day his score stood at 34 destroyed, 7 shared destroyed 3 probables and 10 damaged.He was the highest scoring Royal Air Force fighter pilot of World War II. He had flown 515 combat sorties and shot down Thirty four Nazi planes, shared in the destruction of seven more, three probable victories and 10 damaged. All of his victories were against fighters. After the war Johnson remained in the RAF and retired in 1965 after twenty five years of service to his country.